How to Backup iPhone to iTunes with/without iTunes? The consequence of no backup iPhone could be devastating, which is why backing up your iOS devices including iPhone, iPad and iPod should be your priority. You can easily have access to your information when it is backed up. In case your phone gets stolen, wiped or you change your device, having backed up important data grants you an easy access to your backup files. There are many ways to back up your iPhone. For example, you can backup iPhone to iTunes, or you can backup iPhone to iCloud, etc. You can choose a way that suits you best. Here, in this post, we focus on iPhone backup to iTunes. Part 1: How to Backup iPhone to iTunes with iTunes? Part 2: How to Backup iPhone to iTunes without iTunes? 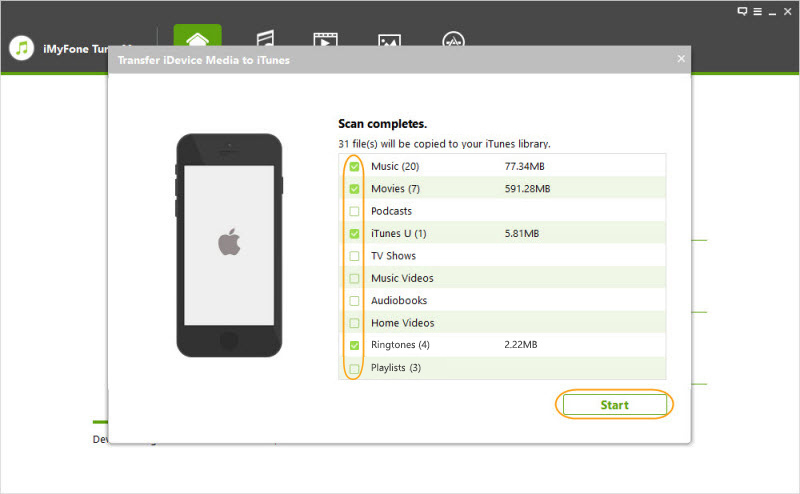 Here, we start to backup iPhone to iTunes with iTunes itself. By utilizing iTunes, we can successfully backup iPhone to iTunes. There are two approaches in backing up iPhone to iTunes with the help of iTunes: backup iPhone to iTunes using USB cable and backup iPhone to iTunes using Wi-Fi Sync. Step 1. Connect your iPhone to your PC using a cable, and launch iTunes. Step 2. Look at the top for a small iPhone icon. Click on the icon, and under summary which is on the left side menu, click "Back up Now", and then click "Apply". Step 1. Before you begin to sync your data, ensure your iCloud is turned off. Go to Settings on your phone > Your Name > iCloud > iCloud Backup, and toggle iCloud Backup off. Step 2. Now to synchronize iPhone to iTunes using Wi-Fi. Go to Settings > General > iTunes WLAN Sync, connect your iPhone to your PC, sign in to iTunes using your Apple ID, and then click a small iPhone icon. Step 3. Select Summary in the menu that appears and scroll down to options Select "Sync with this iPhone over Wi-Fi" and click on "Apply". 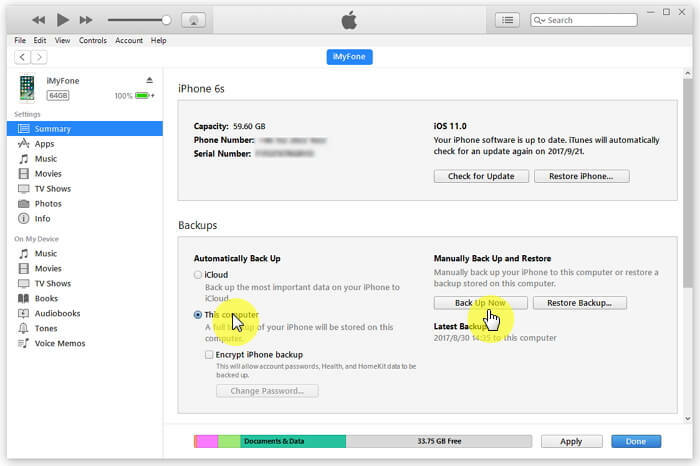 During iPhone backup with this method, you cannot selectively back up data on your iPhone. Worse still, you might overwrite the old backup during the process. Sometimes, iTunes can be unstable causing lots of headaches. Backing up iPhone with iTunes is refrained by many iTunes limitations to some extent. A lot of users feedback that they will run into so many iTunes errors during iTunes usage. Many users consider backing up iPhone without iTunes. Yes, actually you can back up iPhone media files without using iTunes. 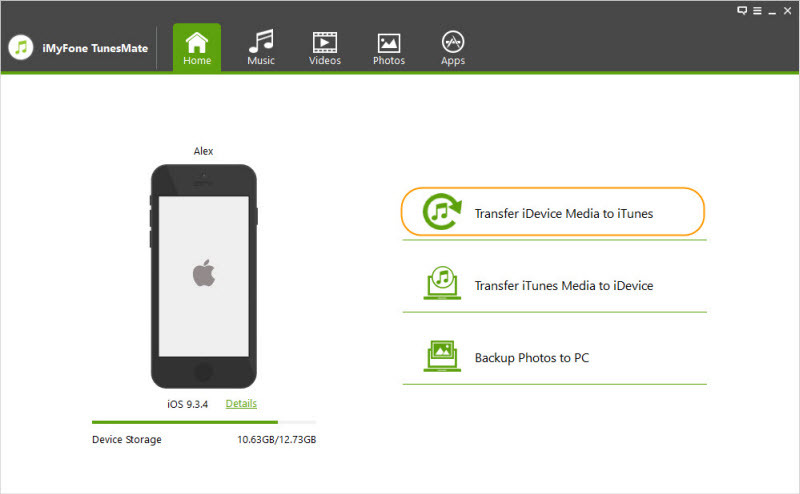 Therefore we need to look for a more effective and convenient way to backup iPhone to iTunes. Next we look at how to back up iPhone to iTunes without iTunes but with a thrid-party program called iMyFone TunesMate. There has never been an easier way to backup, restore and have your files secured online. Definitely, this has come to save us from unnecessary stress. With iMyFone TunesMate, you can enjoy unlimited customer satisfaction by getting the most out of this software. Things got relieving just after the iMyFone TunesMate came to limelight. The third-party program we mentioned here is able to bypass iTunes limitations, iTunes error and iTunes password for users to back up iPhone in an easy way. Just a few mouse click, you will get iPhone backup easily and conveniently with iMyFone TunesMate. Two-way Backup Option: backup files from iPhone to iTunes/computer, and vise versa. Support Both Free and Paid Music/Movies Backup: not only paid files but also free files are supported. No Data Loss: no data loss during backup process. Support unlimited iDevices and unlimited iTunes libraries: backup iOS data to and from unlimited devices or iTunes libraries. Using iMyFone TunesMate is easy, no special knowledge needed; you just need the basic computer operational knowledge to use the software. 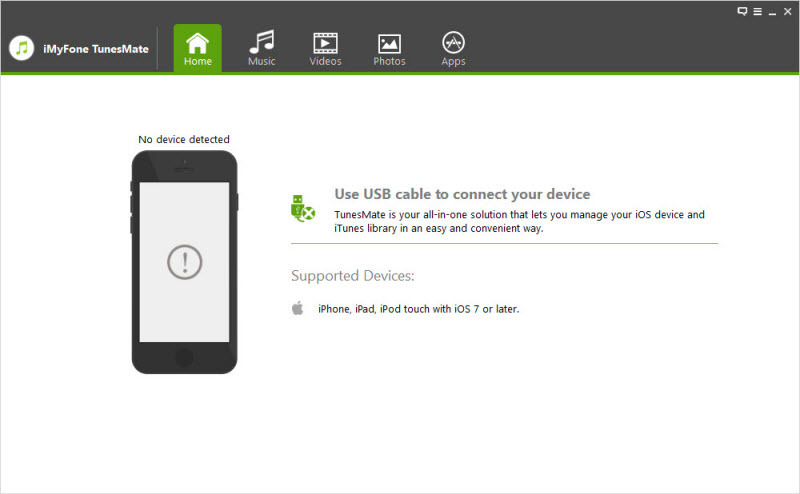 The steps below will guide you through to backup iPhone to iTunes with iMyFone TunesMate software. How Do I Backup My iPhone to iTunes Using iMyFone TunesMate? Step 1Download, install and launch iMyFone TunesMate on your computer. And connect your iPhone with computer with the original USB cable. Step 2On the home interface, click "Transfer iDevice Media to iTunes", and you will get to see media such as music, videos and other folders for you to preview and choose which you want to back up. Step 3After you have selected your media files, click on "Start" to begin the backing up process. This process can take a few minutes, depending on how large your files are. Take a chill and watch your data getting backed up on a secured server. With iMyFone TunesMate, you can have easy access to your files anytime. Backing up your files has never been this easy and convenient.